The use of the feng shui money frog has deep symbolic roots. It is a mythological creature with three legs that is said to attract wealth and abundance. This is why you can often find a money frog in Chinese establishments. 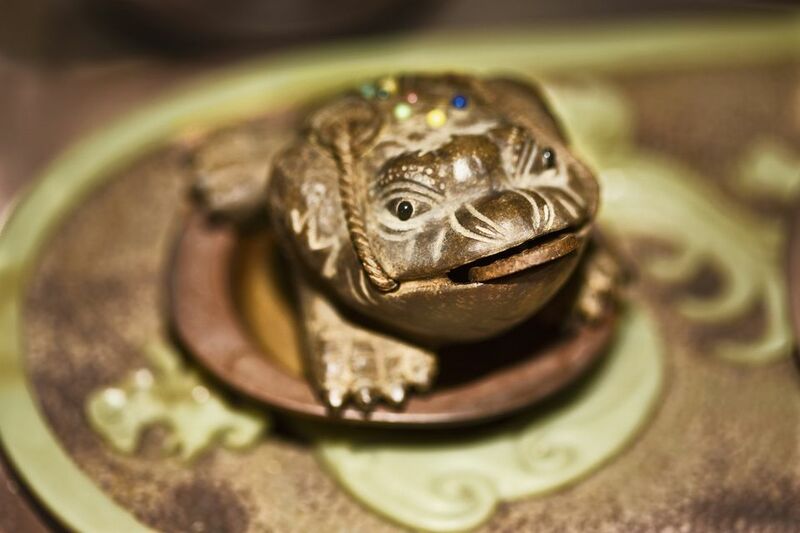 A money frog can be placed in more than one location and position, but there are a few general rules for where and how to place it in order to enjoy the benefits of this spiritual symbol. The money frog also called the three-legged toad or money toad comes from Chinese folklore. According to the legend, a wife of one of the eight immortals stole the elixir of immortality and drank it, turning her into a toad. Instead of two hind legs, the toad has the tail of the tadpole. Frogs and toads are associated with water, which is symbolic of wealth. It is common for a money frog to have a coin in its mouth, as an offering for the owner or the household where the frog resides. If you come from Chinese culture, or if you have a strong belief in the symbol of the money frog, it can be a powerful feng shui money cure for you. However, if you have no energetic or emotional connection to this specific symbol, it will have little effect on your feng shui efforts. Always position your feng shui money frog in a respectful way, so it is best not to place your money frog directly on the floor, but rather on a raised surface, such as a cabinet. The cabinet (or another surface) should be placed against a wall for backing support. It should not be in the middle of a room, under a window, or in a hallway or traffic area. Also, it is best not to place a feng shui money frog in your bedroom or in your bathroom. Feng shui is all about creating good energy. If you want to attract more money, create an abundant, prosperous, money-like energy in your home; this will help attract a stronger energy of money and abundance into your life. It is important to understand that you must create good feng shui energy throughout your home, not just in specific areas like the money area. Start by defining your bagua map and strengthening your feng shui money area, then look into placing your money feng shui frog for best results.